In a remote valley in the Bavarian Alps, the Germanic students of those eugenicists seek to uncover the secret of the Juke and the promise of the bermensch. In Paris, Dr. Andrew Waggoner enters his third decade of unravelling the mystery of the elusive organism. Jason Thistledown, now a veteran pilot of World War I, gets ready to embark on a new career flying mail and passengers in North Africa and, he hopes, forget the profound horrors that have shaped him. 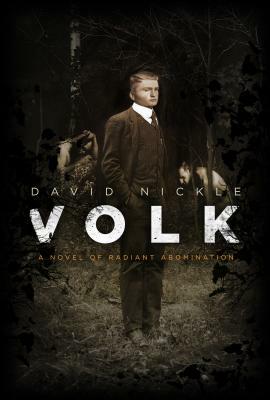 David Nickle is the author of several novels, including Eutopia: A Novel of Terrible Optimism (which precedes Volk: A Novel of Radiant Abomination), and numerous short stories, some of which have been collected in Knife Fight and Other Struggles and Monstrous Affections. He lives and works in Toronto as a journalist, with his wife, the author and futurist Madeline Ashby.